Space travelers in science fiction often use "warp drive" to quickly travel across long distances in space. 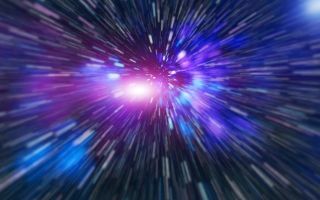 Will humans ever figure out how to travel faster than light? Almost 50 years ago, humans were walking on the moon. But we stopped going in 1972 and never ventured any farther, except by sending robotic probes. Humans have never gone to Jupiter, as the book and movie "2001: A Space Odyssey" promised us, or even to Mars. What is it that makes travel far away so difficult? Besides the obvious human health concerns (living in microgravity tends to weaken a body over time) and budgetary issues, there are vast technological problems with traveling to faraway places. Space exploration will be covered in "AMC Visionaries: James Cameron's Story of Science Fiction," which runs its second episode tonight (May 7). James Cameron (left) stands with "Star Wars" creator George Lucas. Some science fiction stories (such as the 1962 children's book "A Wrinkle in Time," which was recently released as a film in theaters) use wormholes to get around the problems with instant travel. But wormholes also have issues. It's hard to figure out how to get enough mass in one place to create one, although black holes are a leading candidate. Then there are the problems of figuring out how to hold wormholes open and how to safely traverse them. Landis said his idea would work for people, but unless you made the spacecraft very small (as Breakthrough proposes doing), you would not get to Alpha Centauri quickly. It's only if you "send a very small probe," he told Space.com, "that you could make it smaller and faster, and perhaps get to the nearest star in something less than a lifetime." NIAC continues to fund interstellar studies, as it did in 2017 when it awarded a Phase 1 grant to Heidi Fearn at the Space Studies Institute in Mojave, California. The type of interstellar spacecraft propulsion studied in this grant might use Mach effects to move across the universe. The term "Mach effects" refers to how the rest masses of objects vary as they accelerate, with changes occurring to their internal energies. Of course, lasers aren't the only solution to getting somewhere far away, and fast. Back in 1958, General Atomics' Ted Taylor and physicist Freeman Dyson of Princeton University worked on an initiative called Project Orion, which would use atomic bomb explosions to propel a spacecraft. But Landis cautioned that the Orion proposal would need between 300,000 and 30 million hydrogen bombs. "That's a pretty hard ship to do," he remarked. Nuclear power, however, remains a popular thought experiment for space travel. In the 1950s, a joint NASA/U.S. Atomic Energy Commission program called Nuclear Engine for Rocket Vehicle Application (NERVA) examined nuclear fission (splitting atoms) as a means of traveling around the solar system. Research continues in the field. Last week, NASA and the Department of Energy's National Nuclear Security Administration released the results of a demonstration called Kilopower Reactor Using Stirling Technology (KRUSTY). Their system showed that nuclear fission could be used for going to solar system destinations, such as the moon or Mars. Nuclear fusion (fusing atoms) is another possibility; a 2012 NIAC proposal by the University of Washington's John Slough examined a fusion rocket for getting to Mars or other destinations quickly. The British Interplanetary Society (BIS) also examined fusion in the 1970s, in an initiative called Project Daedalus. And the BIS project was, in turn, picked up by Icarus Interstellar, which is aiming to design a starship by the year 2100 that could use fusion technologies. The caveat is that current fusion reactor systems are inefficient, requiring more energy input than they actually output. "We can create fusion bombs at least and have made progress at fusion reactors," Richard Obousy, a director and former president of Icarus Interstellar, told Space.com. "It's not beyond the realm of possibilities in a few decades, if there was a concerted effort." Other possibilities include ion propulsion (accelerating nuclear ions with electricity, such as was done in the robotic Dawn spacecraft) or nuclear electric thrusters, which provide little thrust but are more efficient in terms of fuel usage. To move faster, one could use an antimatter engine, which would interact with normal matter to propel a ship at high speed. The challenge there is not only in generating antimatter in large quantities (something we don't yet know how to do know), but also in making sure the explosion happens when we want it to occur. After all, if antimatter and matter touch, they annihilate each other instantly, releasing tremendous energy. There's also the brute-force method of employing a chemical rocket: the types of rockets that routinely launch from Earth today, using fuel such as liquid oxygen and liquid hydrogen. A spacecraft could use enough propulsion to get to 10 percent the speed of light. That's not all that fast by celestial terms, but it's enough to get moving at a reasonable pace. But as Obousy said, a single-stage rocket would require more mass than exists in the known universe. "This can be mitigated with multiple stages, but it gives you an idea as to why going the speed of light is an unrealistic option for chemical rockets," he added. "I don't think we can ever underestimate something as tremendous as taking a picture of a planet in another solar system up close," Obousy said, "and then of course, which is more exciting, there are astrobiological studies. As far as we know, we are the only life in the universe, but I think the idea that there could be life on other worlds is certainly quite tantalizing, and I think people are interested." Landis said that if there's one lesson from exploring space, it's that the universe is "weirder than we thought." Observations of exoplanets done with the Kepler Space Telescope, for example, have revealed solar systems wildly unlike our own. Some have "hot Jupiters," or huge gas-giant planets orbiting close to their parent stars. Other solar systems may have "super-Earths," or rocky worlds that are between the size of Earth and Neptune. So, this makes it harder to predict what people may encounter as they look at faraway places, Landis said. "There are all sorts of things that we never imagined," he said. "So, the first thing we'd discover if we solve the problems and go out and start exploring other planets is they are strange beyond what we can believe." This story was inspired by Episode 2 of "AMC Visionaries: James Cameron's Story of Science Fiction," which airs tonight at 10 p.m. EDT/PDT (9 p.m. CDT). A companion book is available on Amazon.com.